J. Flam, K. Rogers and T. Clifford, Robert Motherwell Paintings and Collages, A Catalogue Raissoné 1941-1991, Volume Two: Paintings on Canvas and Panel, New Haven and London, 2012, p. 260, no. P474 (illustrated in color). 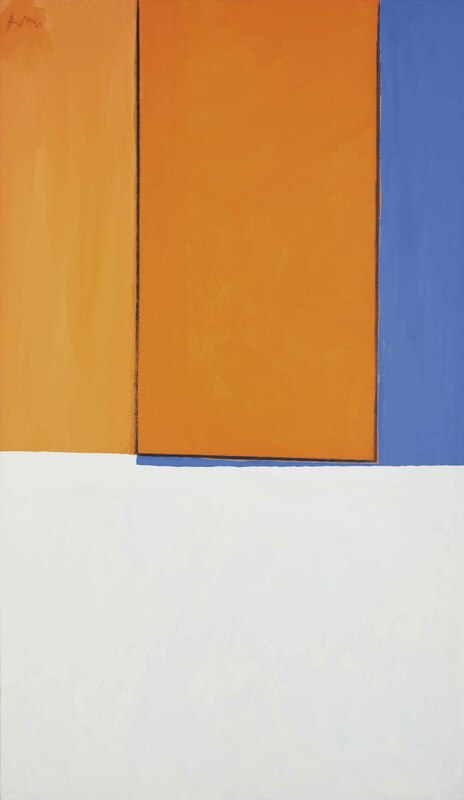 Rome, Marlborough Galleria d'Arte; Milan, Galleria Toninelli and Turin, Galleria la Bussola, Robert Motherwell, October 1969-February 1970. St. Gall, Galerie im Erker and Kustverein Freiburg, Robert Motherwell: Bilder und Collagen 1967-1970, June-October 1971 (the exhibition catalogue erroneously dates the exhibition as shown in 1970), cat. no. 4 (illustrated in color on the cover). Mussée d'Art Moderne de la Ville de Paris, Robert Motherwell: Choix de peintures et collages 1941-1977, June-September 1977. Gainesville, Samuel P. Harn Museum of Art, Paradigms and the Unexpected: Modern and Contemporary Art from the Shey Collection, February-May 2008, pp. 178-179, cat. no. 74 (illustrated in color). "The Opens and the Elegies are Motherwell's two most archetypal-and most varied and monumental-series, which in many ways express opposite aspects not only of his sensibility but of his being: anguish and passion, on the one hand; serenity and contemplation, even acceptance, on the other. Yet at the same time that they seem like polar opposites, the two series reflect something essential about the dialectical way in MOtherwell proceeded. The Opens, like the Elegies, are based on a number of oppositions, though oppositions of a very different sort: not between black and white, straight lines and ovals, which MOtherwell considered to be-among other things-a contrast between life and death, and between male and female, but between amorphous fields of color and the straight lines that divide and modulate them: a new way of resolving the age-old conflict between painting and drawing. In the Opens Motherwell used the polarity between amorphousness and geometry to evoke both opposition and ultimate harmony, as between chaos and order, emptiness and creation, nature and culture. So while the Open paintings are a response to a particular moment in the history of painting, synthesizing the recent renovations of Minimalism with Mothewell's renewed engagement with the art of Miro and Matisse (at a time when the contribution of Matisse in particular were undergoing a critical reevaluation by artists and writers alike), they also embody something essential, primitive, and timeless (J. Flam, "Paintings, 1967-1974: Opens and Signs," Robert Motherwell: Paintings and Collages: A Catalogue Raisonne, 1941-1991, ed. by. J. Flam, K. Rogers, and T. Clifford, New Haven and London: 2012, pp. 138-139).